I am not a coffee drinker; my mother on the other hand, having grown up in New Orleans, would gulp down ten to twelve cups a day. But not me. So what do I do on my coffee break? I indulge in a quick read here at Catholic Lane or on my other favorite Catholic site, New Advent. I did just this earlier today and what a gem I devoured. It was better than a triple Marble Mocha Macchiato with extra whipped cream (I am told by one of my adult daughters that this is an amazing espresso drink). And I enjoyed reading this more than indulging in my weakness, which is a piece of New York-style cheesecake topped with fresh strawberries and a dollop of hot fudge topping. When the Pope asked whom Mother Teresa had in mind for this “job”, she mentioned Father Damian de Veuster, the Belgian missionary born in 1840 who lived on the Hawaiian Islands among the lepers and cared for the sick until finally he himself died of the disease. “Do you know him, Holy Father?” asked Mother Teresa. Pope John Paul II knew Mother Teresa quite well by this time, well enough to know it would not be fruitful to get into a long discussion with her concerning the matter of the standard three miracles needed before a person could be declared a saint. So he instructed Mother to discuss the matter in person with Cardinal Peitro Palazzini, the prefect of the Congregation for the Causes of Saints. “Mother Teresa, the Holy Father has sent me to you. What can I do for you?” was the first thing [the Cardinal]said, which [Msgr. Maasburg] translated for him. “Yes”, she replied with great enthusiasm. “This would be a good opportunity to change that tradition!” Another goal! Success seemed within her grasp. “After all, the Bible takes precedence over canon law”, she added, to put an end to the discussion. Msgr. Maasburg then reported it was the only time he had ever seen Mother Teresa speechless. As to Father Damian’s canonization, I am happy to report that Mother Teresa got her saint, as Fr. 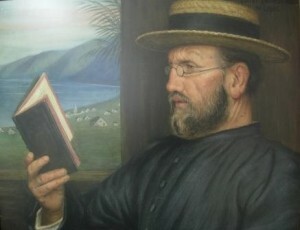 Damian of Molokai was declared blessed in 1995 and on October 11, 2009, Pope Benedict XVI canonized Father Damian de Veuster of Molokai, thereby completing the sainthood process. It seems both Mother Teresa and Cardinal Palazzini each got their way.